The number reflects the amount of work (e.g. tasks or story points) has been added or removed from the sprint during that day. This helps you to improve your sprint planning process. If the team didn’t deliver the whole sprint scope perhaps that was due to the fact that more work was added during the sprint. Now you see it. If you tend to have a lot of scope changes during the sprint, perhaps you should try shorter sprints! From this view, you can click the name of the task to open it in your task management tool in order to see more details about the blocking task. That helps you to quickly fix bottlenecks that might be causing delays. 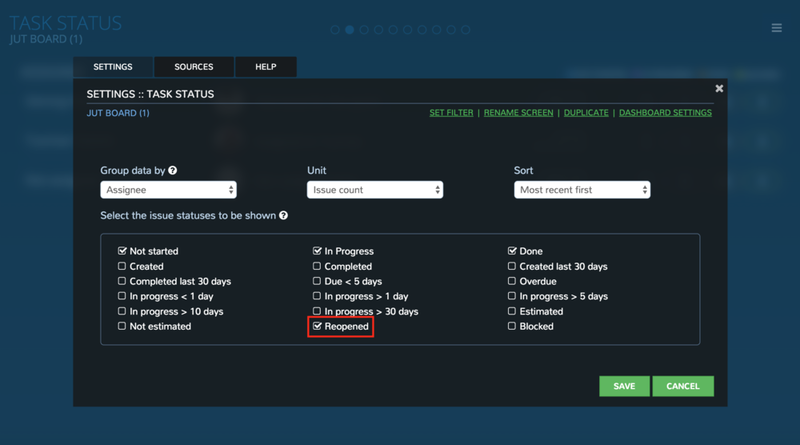 Blocked tasks can also be surfaced in the Task Status screen. Just go to settings and enable Blocked from the checkbox options. Blockers are currently shown only for the tools that support this feature, namely Jira, Asana, and Pivotal Tracker. Have you ever wondered whether your tasks are moving smoothly through your workflow, or whether tasks that have already been completed once, are taken back to work? If you have a lot of reopens, it may be a symptom of a problem rooted in your QA process, or at the requirements specification stage. In either case, the constant ping-pong of tasks moving back and forth is sure to cause delays and unnecessary rework. To see how many of your tasks were reopened, just go to Task Status settings and select Reopened from the checkbox options. We hope that having a better visibility to the scope changes, blockers, and the reopens allows you uncover inefficiencies in your delivery process. Constant scope changes will make it hard to stick to deadlines, and are poison for the team morale. If your cycle times are slow, chances are that your tasks are blocked by some other tasks. Removing blockers quicker allows you to deliver faster. Finally, if your already completed tasks come to haunt you again, the reason may be that your specs were not clear enough. Or that bugs slip through your QA process. In either case, an action is needed. These features are immediately available for all of our SaaS users (refresh your browser if you don't see the changes). If you're using the Docker version, you'll be informed once the upgrade is available.